We must understand the geology as a science that studies the planet Earth (Greek γεια, geo “Earth” and λογος, logos, “study”) that is the science that studies the composition and internal structure of the Earth, and the processes by which has evolved over geologic time. Actually, geology comprises a set of “earth sciences”, well known today from the point of view of their pedagogy, professional development and implementation. Provides primary evidence for plate tectonics understand the history of life through paleontology, and how it was changing, along with past climates. Currently the geology is of fundamental importance in the exploration of mineral deposits (Mining) and hydrocarbons (oil and natural gas), and assessment of groundwater resources (Hydrogeology). Also crucial in preventing and understanding of natural disasters such as removal of general masses, earthquakes, tsunamis, volcanic eruptions, among others. Provides key knowledge in solving environmental pollution problems, and provides information on past climate changes. Also play an important role in the Geotechnical and Civil Engineering. It is also an academic discipline with important areas of research. By extension, there are new branches of study and other bodies of the solar system matter (astrogeology or planetary geology). Geology is not an exact science … yet this because geological processes do not strictly follow a specific pattern but often there is a coincidence rather than causation but there have been major advances in the knowledge of the planet and with the help of new technologies, the task is easier. We say that is not accurate because we still can not accurately predict the occurrence of earthquakes, tsunamis, volcanic eruptions, climate change among other terrestrial phenomena. But for the study of elements forming minerals that form rocks or metal, already has a pattern where sciences such as chemistry, physics, thermodynamics, aerodynamics, mathematics among others, co-operate make an accurate diagnosis of the elements , rock types, structures and types of faults that make up a particular landform. Spanish Río Motagua, river in eastern Guatemala, rising in the central highlands near Chichicastenango. The Motagua is Guatemala’s longest river, measuring approximately 250 miles (400 km). Flowing generally eastward and northeastward, it empties into Omoa Bay off the Gulf of Honduras at the Honduran border. Near its source it is referred to locally as the Silbapec River and further downstream as the Río Grande. The Chuacús, Minas, and San Isidro mountain ranges rise from the left bank of the Motagua; the major tributaries, including the Chiquimula, flow from the south. Navigable by shallow-draft boats for approximately 125 miles (200 km) upstream from its mouth, the Motagua used to be a major transportation artery for the bananas, coffee, and other fruits raised in the valleys of the eastern portion. There are some placer gold mining along its course. Rio Motagua is our main source to obtain aluvial gold, yes, and almost all our projects are located in this golden river. In geology, a fault is a discontinuity formed by fracture in the Earth’s surface rocks (up to 200 km depth) when tectonic forces exceed the rock strength. The rupture zone typically has a well defined surface called fault plane and its formation is accompanied by a sliding of the rock tangential to this plane. The movement causing dislocation can have different directions: vertical, horizontal or a combination of both. In the mountain masses who have risen by fault movement, displacement can be thousands of meters and shows the cumulative effect, over long periods, small and imperceptible movement, rather than a single major uprising. However, when activity in a failure is sudden and sharp, can produce a great earthquake, and even a rupture of the earth’s surface, creating a so-called topographic fault scarp. A fault is active when deformed Quaternary sediments, ie when shown evidence of movement during the last 1.8 million years. Some active faults are often associated earthquakes demonstrating that still work. The sliding fit can be sudden jumps giving rise to earthquakes and a process that occurs is that two faults collide, and earthquakes occur followed collide downtime. The larger earthquakes have been caused by jumps of 8-12 m. Slippage can also occur slowly and continuously, perceptible only with instruments such as GPS stations after several years of observations. The first type are fault lines while the second is anti seismic or crawling. However, when considering large time intervals of the order of thousands of years, both average moving at speeds of a few millimeters to a few centimeters per year. An example is the failure of the Rio Motagua. The Motagua fault is a transform fault in Guatemala, which follows the course of the Motagua River from the Caribbean coast to Chichicastenango in the department El Quiché. It has a left lateral movement direction and is part of the fault system forming the boundary between the North American plate and the Caribbean plate. This fault divides two very different fields: Maya North Block and South Block Chortis. The overall direction displacement along the fault-Polochic Chixoy is close to 130 km, and has happened in the last 10.3 million years. Based on these values​​, this fault has a displacement rate (averaged over long period) of 13 mm per year. Little is known about the displacement of the Motagua fault, however, the recent sedimentary deposits shift suggests a shift between 6 and 10 mm per year. Several earthquakes have been produced in this failure, one of the best known of the Guatemala earthquake of February 4, 1976. This earthquake broke 320 km along the Motagua fault. Failure of Chixoy-Polochic was broken during a strong earthquake in 1816. 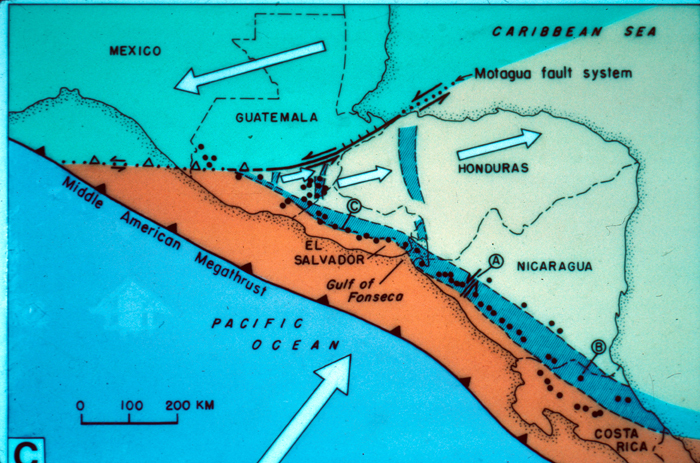 The Motagua fault is a fault Polochic located in southern Chiapas, Guatemala and Belize crosses and then go into the Caribbean Sea. This fault represents the separation of the North American plate tectonics and the Caribbean plate, when internal within the Caribbean Sea passes very close to Cuba, Haiti, Dominican Republic and then together in the Lesser Antilles and turns south to get together and do tectonic division of the South American plate and the Nazca plate, after the northward and made ​​a division of the Cocos plate to return to the same trip. This failure gives seismic influences on Chiapas, Guatemala, Belize, and the Lesser Antilles, besides causing volcanic phenomena that give rise to the volcanoes of Guatemala, Chiapas and the Lesser Antilles.